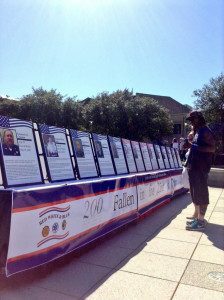 Savannah, GA – October 21, 2015 – The Two Hundred Club of the Coastal Empire held its inaugural Red, White and Blue Barbecue in Ellis Square on Friday, October 16 and raised over $23,000 to help the family members of fallen first responders. Over 1,500 supporters gathered throughout the day eager to support the donation based event while enjoying world class BBQ, ice cream, beverages and live music. Local bands In for a Penny, Keith and Ross and Bottles and Cans performed for the crowd while Savannah Metropolitan Police vehicles were on display with a tribute to fallen first responders and information about the Two Hundred Club’s work. Supporters socialized over ribs, pulled pork and delicious side dishes at tables set up in the center of Ellis Square, while many others picked up pre-ordered to-go orders at the drive through to take back to the office. Over 1,300 meals were plated and served thanks to many generous sponsors and volunteers. SPONSORS INCLUDED: Savannah Lodging, GC BBQ, Wet Willies, Gerald’s Pig and Shrimp, Ruby T’s, Savannah Technical College, Savor – Savannah International Trade and Convention Center, Paul Kennedy Catering, City of Savannah, Savannah Fire and Rescue, SCMPD, Coca Cola, Service Brewing, Adalay, Southern Eagle, Savannah Distributing, Advanced AV Rentals, Keith and Ross, Bottles and Cans, In for a Penny, Host South, Yates Astro, Old Savannah Tours, Pedi Cab Savannah, Savannah Waterfront Association, Triangle Ice, Levy Jewelers, Dan Vaden, Lesley Francis PR, Andaz, City Market, Belford’s, StayinSavannah.com, AOK Portables, American Hotel Register, Paper Chemical Supplies, Buzz Crider, Creative Approach, Leopold’s Ice Cream, ThyssenKrupp Elevators, Barnes Restaurant & Catering, Savannah Special Events by Ranco, Celebritees, WTKS, WRSQ, GPB, Savannah Magazine, Savannah Morning News, Connect Savannah, Visit Savannah, WSAV, WJCL, BOB 106.9, ROCK 106.1 and WTOC. The Savannah-based Two Hundred Club is primarily funded through tax-deductible memberships, which range from $250 to $1,000 per year. Donations also are welcome. The benefits are determined at the sole discretion of the club’s board of directors and all proceeds go directly to the families of these fallen heroes in our community. Members include professionals, homemakers, community leaders, small business owners and managers, corporate executives, retired and active-duty firefighters and law-enforcement officers. For more information about The Two Hundred Club please visit www.twohundredclub.org.